In Portuguese we have a few sayings that use the word dog as a qualifier: ‘vida de cachorro’ (dog’s life) usually implies a very difficult life in which one feels disempowered and submissive. On the other hand, something can be qualified as ‘bom pra cachorro’. Literal translation would be “good for dogs”. However, the actual meaning is ‘really good’. Well I can assure you that this Saturday Feb 18th A Benefit Concert for Dogs will be bom pra cachorro (really good) for dogs and humans. A wonderful show in which dogs and humans will unite in community for good music and in support of a good cause. The event will collect funds for A Leg Up Rescue, an organization that rescues small dogs. This show has already brought many joys to all of us involved in putting it together. We have received generous support from sponsors, two TV Channels, and wonderful people. Great sponsors such as Street Smart Brazil, TrickDog Treats, Vibrapet, Canine Wines, Lagunitas Brewing, Bi-Rite Market, PureMugz Electrolyte will offer dog treats, beverages, snacks, and a concert program with a translated summary of the lyrics. 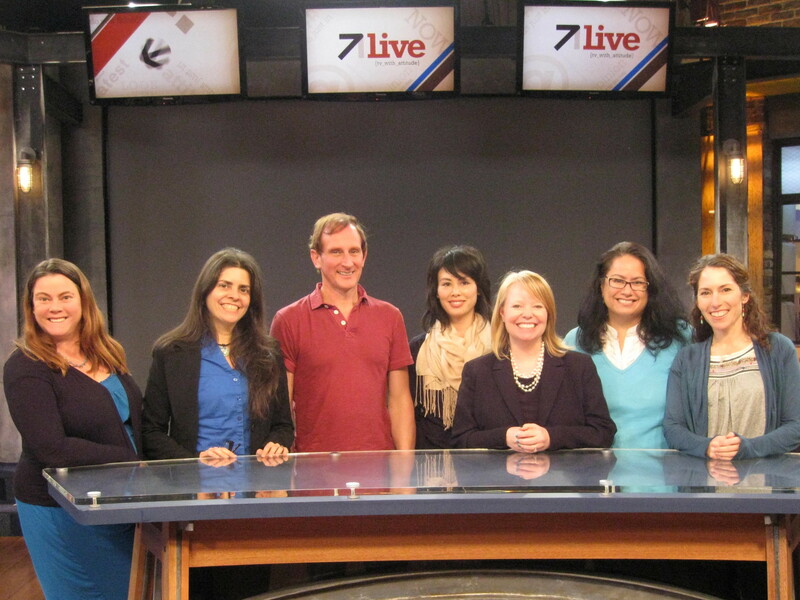 The Benefit for Dogs crew at 7Live at KGO TV studios. I think they had lots of fun! The Feb 18th concert for dogs has echoed in the newspapers and blogs of Brazil. There were two articles in Portuguese about the concert published today at the main newspapers of Natal ( one of the most visited capitals of Brazil): Tribuna do Norte, : Cantor natalense realiza show para cães nos EUA (Singer from Natal does a concert for dogs in USA). and Diario de Natal : Potiguar canta ‘pra cachorro’ nos Estados Unidos (Native from RN sings ‘for dogs’ in USA. Also many Brazilian blogs spread the word: Potiguarte, Sitio Novo e Foco, O Nordeste, Veganismo, No minuto. During the event we will have the pleasure to have the Brazilian Digital Channel BDCi tv from Los Angeles covering the event. They will make sure to interview us and record the best moments of the show. This event is attracting wonderful people who feel touched by the cause. People like Fiona, a Vancouver BC resident, decided to buy a ticket even though she couldn’t attend the event. As soon as Fiona received the news that her friend’s dog has passed away she thought about buying a ticket as symbolic way of honoring her friend. This, and many other gestures of love for dogs, are really touching me. The concert is tomorrow and I already feel I have received so much. It has been a pleasure to collaborate with Wag Hotels for this fundraiser for A Leg up Rescue. It has been a blessing to collaborate with talented and generous musicians such as Bryan Olson (guitar), Dan Magay (sax, flute and clarinet) and Michaelle Goerlitz (percussion). We are all ready for the concert and blessed to support our little friends. Practice for the ' Benefit Concert for Dogs'. 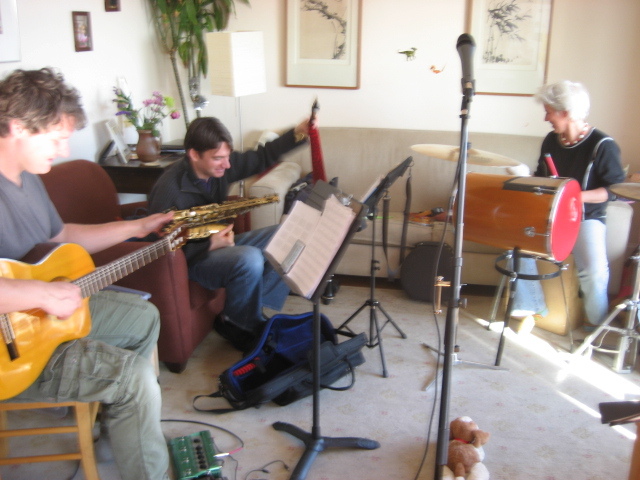 Bryan Olson (guitar), Dan Magay (sax) and Michaelle Goerlitz (percussion). We are ready!!! Benefit Concert for Dogs. Sat Feb 18th 7-9pm. Doors open at 6:30pm. Wag Hotels, 25 14th St, San Francisco. This entry was posted in Brazilian Music and tagged "7Live Show", "A Benefit Concert for Dogs", "Bi-Rite Market", "Bryan Olson", "caderno muito", "caderno viver", "Canine Wines", "concert for dogs", "Dan Magay", "De Coro & Alma", "diario de Natal", "Lagunitas Brewing", "Michaelle Goerlitz", "Muito", "no minuto", "O nordeste", "potiguarte", "PureMugz Electrolyte", "roberto guedes", "sitio novo e foco", "tribuna do norte", "TrickDog Treats", "Vibrapet", "Wag Hotels". "A Leg Up Rescue", cantor. MPB, Joseh Garcia, KGO, Natalense", San Francisco, Street Smart Brazil, Veganismo. Bookmark the permalink. Thank you, Joseh! Muito obrigada! It is a great pleasure to be a (small) part of your show again. As a regular donor to animal protection organizations, I am very excited about this event. I can’t wait to see you tonight. By the way, the program/set list is just amazing!